As they set out to undertake sweeping change on the heels of a “bad decade,” leaders at the Workplace Safety and Insurance Board decided to look to research evidence to guide the reform. At last month’s Alf Nachemson Memorial Lecture, hosted by the Institute for Work & Health (IWH), former executive Judy Geary shared stories about working with researchers to shape policy. A slidecast of that lecture is now available. Hear an insider’s perspective about the change—and how IWH helped provide the science behind it. Whether as a cashier at a 24-hour supermarket, an office building cleaner or a long-haul truck driver, increasing numbers of Canadians are working nights, evenings or rotating shifts. These schedules come with higher injury rates and other health consequences. 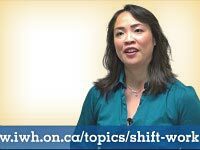 In a new IWH research video, 2013-2015 Mustard Fellow Dr. Imelda Wong sums up some of what she found in her shift work research over the last few years. 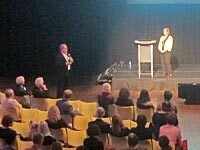 Thanks to everyone who has sent in a research abstract to PREMUS 2016, the 9th International Scientific Conference on the Prevention of Work-Related Musculoskeletal Disorders, to be held in Toronto June 20-23, 2016. Those who haven’t yet submitted an abstract still can. The call-for-abstracts deadline has been extended until November 30. Do you have findings to share from a workplace intervention study? A new method of measuring exposure? How about an innovative way of understanding the burden or epidemiology of the condition? We want to hear from you. Throughout the year, IWH holds plenaries where scientists from across Canada and around the globe present their research on work and health. IWH plenaries are typically held on Tuesdays at 11 a.m. at 481 University Ave. If you can’t make it in person, you can now join in remotely through our livestream option. 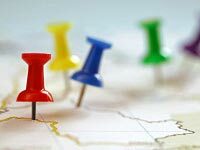 Join in on a roundtable discussion with partners, researchers and other stakeholders as they build a roadmap for improving work disability policy in Canada. Hear from keynote speaker Mike Bradley, mayor of Sarnia, Ont., on what employers can do. There are just a few days left to register for the Centre for Research on Work Disability Policy (CRWDP)’s national symposium, Informing the Roadmap for Work Disability Policy in Canada.